Parking available at the Civic Center Plaza Garage (355 McAllister St between Polk St and Larkin St), Performing Arts Garage (360 Grove St at Gough St), at 110 Franklin Street (at Oak Street), and Star Park (69 Polk Street). Assisted listening devices are available (Listen LT-800, LR-400 and LA-165) on 72 MHz. Built in 1927, the Sydney Goldstein Theater [275 Hayes Street] is a landmark venue located in the heart of San Francisco’s performing arts district (across the street from Davies Hall musicians’ entrance). 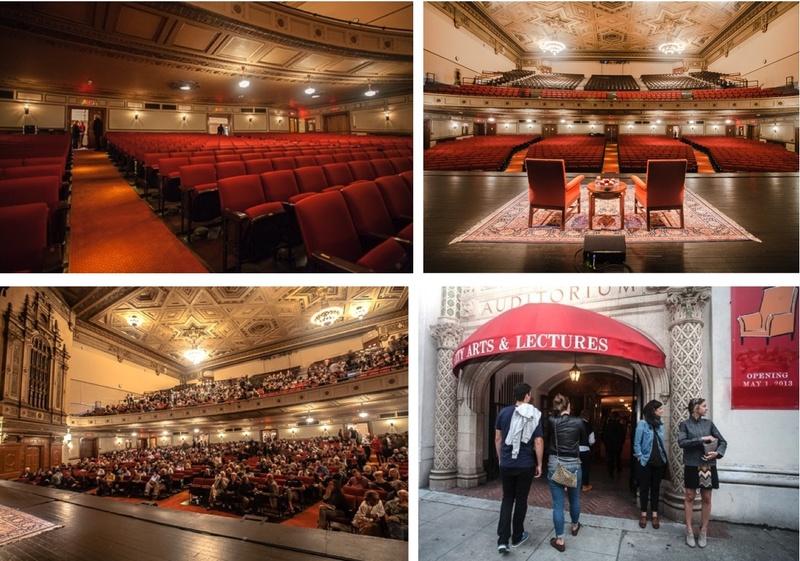 City Arts & Lectures restored and reopen the stunning 1,687-seat hall in 2013 (it was closed to the public for over thirty years). The hall features original architectural details, excellent acoustics, and a well-designed layout with unobstructed views throughout the orchestra and balcony, as well as state of the art lighting, a Meyer Sound system, new curtains, plush upholstered seats, newly decorated green room, and a dressing room. The Sydney Goldstein Theater is an ideal venue for a wide range of performances and a uniquely beautiful setting. For rental rates, theater specs, and information on renting the theater, please contact us at 415-563-2463 or theater@cityarts.net.